We all know there is a new iPad coming and we are all speculating what features it will have. I am almost positive two features will be not included. Neither are changeable battery nor a SD card slot. Why? Because Apple has no mobile device which allows you to change the battery or has a SD card slot (i don't count notebook anymore as mobile). But a few things we need are obvious. I am using as a smart phone the iPhone 4 (I guess in June the iPhone 5) and the screen of the iPad looks so bad now. When I got it new, i did not know better and thought how cool, but since i have the iPhone4, I wished the iPad had a better screen. I never thought I need a camera on the iPad, but since Skype works with camera on iOS it would make so much fun to talk to my family overseas from the backyard, the couch or kitchen without holding the heavy macbook pro. And to be honest I feel the iPhone screen is too small for video calling. It is fun but iPad would be so much more useful. Or webex with split screen this would be much better, i could do my conference calls at Starbucks. Rear facing camera would be nice as well, not that I think I need it, but it would not hurt to have it. Some movies or games are still not 100% smooth, and if they are, faster is always better. The real issue i have with office documents converted to pages or numbers. To edit them takes forever, sped would help. These are the hardware wishes. For the iOS I have some more. Ok, i admit we have already two iPads, but still everybody is using my iPad, it would be nice to give my wife and son their own login with their own Apple account to download apps. The device is expensive enough to allow multiple user accounts. Everything should be in the cloud or at least easy to share between the devices without the need to upload to mobile.me, to sync with iTunes or to email. All apple devices in one household should have at least read access to all photo albums (maybe the function is already there and i don't know it) but I am so annoyed that i take pictures with the iPhone and then i have to send them via email to the iPad to post them in my blog. Why not automatically have access like calendar or address book? I am fine if it does only work in same wifi network. Same as above, but for all movies or songs. Why can't I watch a movie on my iPad from my iTunes library in the server room without work arounds through the browser or other devices? Right now i can play from my iPad to my apple TV but not from computer to iPad. 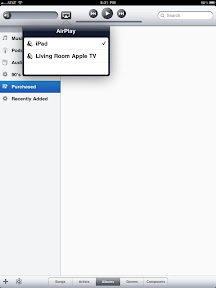 The iPad should be like the apple tv. I hate work arounds, just help us to print to any wifi printer or at least to most of the big brands. This is a call to Microsoft. I would be willing to pay the full office price if I could get it on the iPad. I work in America, I work in a country where you need office. Period. Doesn't iWork work for you? Nope. In my offIce we use Office 2010. pages , numbers and keynote have problem to open them. If it works to open then the edit takes forever or the formatting is off because of missing fonts etc. Especially keynote and PowerPoint don't wok well together. I like keynote better but nobody can really use keynote in PowerPoint because a lot of transitions are not working.